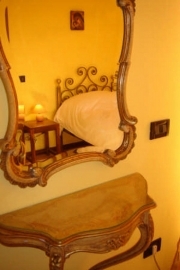 "DolceCasa" is located in a strategic position for trips you may have: 10 km from the center of Verona, 20 km from Lake Garda, 20 km from the airport of Villafranca. The toll motorway north of Verona is 8 km and is easily reached via the ring road. From the railway station of Verona leave the public transport bus that crosses the center of Verona, arrives in Pedemonte 30 minutes. The public transport stop is located 50 meters from the B & B. A 5 minute drive you will find the Sacred Heart Hospital of Negrar. “DolceCasa” is composed of three rooms and two baths, plus a likeable one little kitchen must be able to consume the breakfast, tasting to you the sight of Castelrotto, a laughing small village placed on the top of one hill. The income, equipped of pleasant seats, can also be used for reading. Every room is equipped of air conditioning, Internet WiFi, Sat-TV and safe. In the baths the hair dryer is available. The italian breakfast, is self service in order not to oblige you to the timetables of our family. During the night the outside parking is usable free of charge the B&B. Moreover, upon request, a car place is available in our garage. Suitable transfer service from and to the local airport "Catullo"(VRN).